In Billie and Me, Patti Boulaye goes on an entertaining personal journey in which she discusses the parallels of her life and career with that of the great singer Billie Holiday. 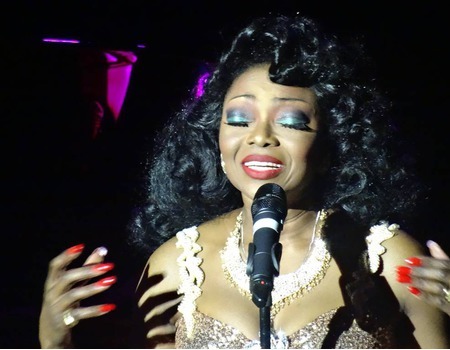 The late Holiday's life, songs and cause of her death have made a strong impact on modern day performers and it was many of Holiday's songs and performances that increased Boulaye's love of jazz. In Billie & Me, Boulaye performs some of her own favourite music and well-known songs by Holiday. Accompanying Boulaye on stage will be her pianist, Mike Moran. Moran was co-producer and co-writer (as well as arranger and keyboard player) on the 1988 album Barcelona - the classical crossover collaboration between Freddie Mercury and opera singer Montserrat Caballe. He produced a number of hits for David Bowie in the late 70s and early 80s, and worked with various artists including Stevie Wonder, Ozzy Osbourne, George Harrison, Kate Bush, Rod Stewart and Elaine Paige, to name a few. This year, Boulaye published her remarkable and moving autobiography The Faith of a Child, that charts her riveting life story through wealth, virtual slavery and civil war, to show-business stardom and success in Britain. This year marks the 50th Anniversary of the musical Hair, the show that changed her life when, at the age of 17, she joined the cast after arriving in London from Nigeria in the early 70's. Recently Boulaye took a journey of a lifetime for the BBC travel documentary series The Real Marigold Hotel and she is also appearing in the latest series of BBC's very popular Celebrity Master Chef. In 2016, Boulaye was awarded an OBE for her charity work in the UK and Sub-Saharan Africa.